We are licensed by the State Bar of California and are fully insured. Full and Complete Representation With Low Flat Fees. We will make sure your case is not delayed or denied. Nobody can get your Citizenship for you faster. you have been a permanent resident for 3 years and have been married and lived with a United States citizen for that time period. you have not lived outside the United States for more than 6 months at a time during the required number of years of permanent residence leading up to your application for citizenship. you have spent as much time in the United States as outside of it during the required number of years of permanent residence leading up to your application for citizenship. You may qualify for an exception to the location requirements (c and d above) if you are in the military (or a widow or widower of a person in the military); or are working oversees. This area of the law can be quite involved. We recommend you speak to one of our immigration attorneys prior to applying for US citizenship. An immigration attorney can conduct an interview to determine whether or not you should apply for naturalization. For a free analysis of your situation please contact us. You can apply with US Citizenship and Immigration Services within 90 days before the required time (above) has passed. However, if you apply too early (before this 90 day period) your case could be disqualified and the USCIS can require you to re-submit your application. Obviously, this would delay your case. You will have to pass an English test (unless you meet an exception below) and a Civics Test. You will also need to pass the Civics Test. 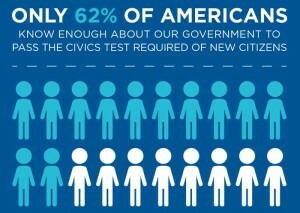 There are 100 possible questions you can be asked about U.S. civics. The civics test will be administered to you orally by the Immigration Officer during your interview. The officer will ask you up to 10 of the 100 possible civics questions. You must answer 6 out of 10 questions correctly to pass the civics portion of the naturalization test. You should study the questions and answers so you will do well on this test. Give the current answers to questions where answers may have changed. Questions where answers will change include: Who is the U.S. President? Who is the governor of California? Who are California’s senators? If you do not have to take the English test due to the 50/20 or 55/15 exceptions you can have the Civics test done in your native language (but only if your understanding of spoken English is not enough to conduct the interview in English). In this case you will need to bring an interpreter with you to the interview and the interpreter must be fluent in your native language and English. 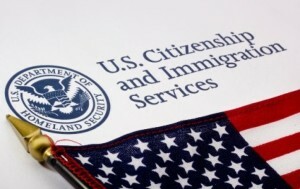 A final note regarding USA Citizenship requirements: USCIS states that if you are 65 or older and have had your green card for at least 20 years at the time of filing your naturalization case you will be given “special consideration” regarding the civics requirement. you must be at least 18 years old unless you qualify for an exception. you must have good moral character. (If you have any criminal history in any country it is highly recommended that you contact a competent immigration attorney before you proceed) Even without a criminal history it is a good idea to be interviewed by a competent immigration attorney concerning this area. There may be exceptions to the above requirements. Therefore you should speak to an immigration attorney before you file your case. If you obtained your green card under false pretenses or have done something which could make you subject to removal (deportation), applying for citizenship could bring you to the attention of the USCIS. In this situation, you could not only be denied citizenship but you could lose your green card as well. You could be subject to removal (deportation). This area of the law can be quite involved. We recommend you speak to an immigration attorney prior to applying for citizenship. An immigration attorney can conduct an interview to determine whether you meet the USA Citizenship Requirements, and whether or not you should apply. Are fees for gaining US Citizenship are very affordable, we offer monthly payments and will work with you in any way possible. The materials provided in this website are solely for informational purposes and do not constitute legal advice. The scope is general in nature and may or may not apply to your particular situation. There may be many pitfalls and problems when you apply for naturalization. For a free analysis of your situation please contact us at 888-801-6558 or 916-760-7270. You should not proceed with an immigration matter (or act on any information in this website) without obtaining competent legal advice from an qualified attorney. Transmission of the materials in this website and receipt by you in no way constitutes and attorney-client relationship. Our questionnaires are user/password protected. Please contact us for access permissions. To view and print the PDF Questionnaires you will need Adobe Acrobat Reader – download is free. With offices in Oakland, Sacramento, Stockton, Fairfield, Roseville and Auburn we are able to serve clients in the entire state of California and through entire United States. In cities such as Reno, Las Vegas, San Francisco, Los Angeles, Phoenix, Dallas, Houston, San Antonio, Salt Lake City, Denver, Oklahoma City, Kansas City, St Louis, Indianapolis, Chicago, Atlanta, Miami, Orlando, Tampa, Charlotte, Raleigh, Cincinnati, Cleveland, Detroit, Minneapolis, Boston, New York, Philadelphia, Pittsburg, Seattle, Portland and the whole country.